Last weekend, Pontypool’s super-welterweight Kieran Gething (0-1-1) was unlucky not to record his first professional win. The former international amateur appeared in the away corner and dropped a very narrow 39-38 decision to debutant Aaron Sutton (1-0). Earlier on Sanigar Events’ show at Ashton Gate in Bristol, Aberystwyth’s Jamie Ambler (12-67-2, 3KO) was beaten 40-37 by another debutant, Nathan Halton (1-0), by a 40-37 margin. A week later, Ambler was back in action and unlucky not to get something from another four rounder against Miles Gordon Darby (2-0). The light-heavyweight was very energetic, even celebrating on the final bell whilst Darby walked with his head down to the corner. Moments later, it was the home fighter who was on the right side of a generous 39-38 scorecard – something even promoter Eddie Hearn disagreed with. Headlining the show, Merthyr Tydfil’s Dai ‘Dutters’ Davies (14-25-2, 2KO) was knocked out in the third round against Watford’s Reece Bellotti (9-0, 8KO) in their British featherweight title eliminator. 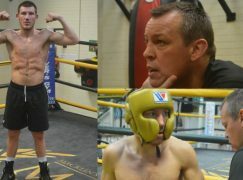 Friday’s fight at East London’s iconic York Hall spearheaded Matchroom Sport’s show live on Sky, presenting the three-time Welsh Area with his most high profile chance yet. 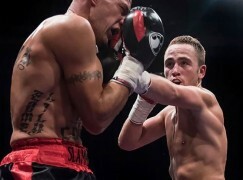 Bellotti, who is being touted for titles, proved his potential with a flush right hand on the button. It dropped Davies to his knees and he was unable to recover in time to beat the 10 count administered by referee Ian John Lewis. Another Welsh champion was in action this weekend. Holyhead’s super-featherweight Mark Evans (13-3-2, 1KO) was dominant against Gloucester’s journeyman Andy Harris (3-42-1). The 35-year-old was appearing for just the second time in 14 months and showed no signs of ring rust, putting Harris on the canvas with a well-timed right hand in the third round. Referee Shaun Messer scored it 40-35 to Evans, who now needs to beat inactivity and stay busy. On the other side of the world, Cwmcarn’s Jamie Weetch (9-2, 4KO) continued his Australian adventure at the Western Australia Italian Club in Perth. The super-welterweight won a wide Unanimous Decision against Paitoon Jaikom (6-25, 2KO). It was Weetch’s first fight for 13 months, having undergone serious elbow surgery last year. It went under the radar but at the end of February, Cardiff’s Henry Janes (10-20, 1KO) scored yet another upset. The lightweight is now on a run of a hat trick of wins for the first time in his 14-year career. Last time out, Janes out-pointed Jordan Cooke (9-2, 3KO) on away territory in the Midlands. 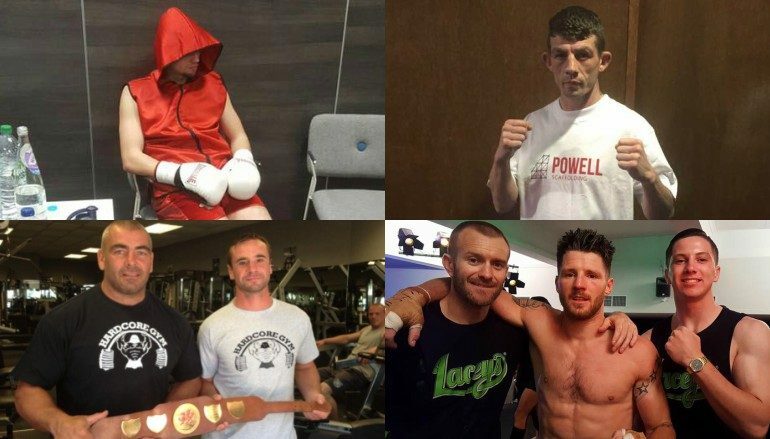 The combined record of Janes’ last three opponents is 18-1, 5KO and could receive a call to contest the Welsh title. Blaenavon’s Mason Jones (3-0) has hung up his gloves. The talented 21-year-old, who is managed by Londoner Mickey Helliet, has looked like a solid prospect but has desires for the cage and Mixed Martial Arts world. The British Boxing Board of Control (BBBoC) won’t allow Jones to still hold a boxing license if he pursues his other passion and the super-welterweight has followed his heart. Last but certainly not least, news emerged on Thursday that Caerphilly boxing legend Don Braithwaite sadly passed away at the age 80 of following a period of illness. As a 21-year-old flyweight, Don won a bronze medal at the 1958 Commonwealth Games in Cardiff and was only beaten by the eventual gold medallist. A professional career followed but Don made his biggest mark as a coach. For decades, Don helped hundreds of amateur boxers from the Rhymney Valley; introducing them to the sport and instilling it’s values at All Saints Boxing Club. His selfless dedication was deservedly recognised with a British Empire Medal in 2015. Don Braithwaite will never be forgotten in Caerphilly, Llanbradach and beyond. Rest In Peace.